However, 80s tees are everywhere and are being worn by celebrities as well as kids not even born in the 1980’s (along with leg warmers, leggings, plastic jewelry, etc.). Princess Di was a major fashion icon during this time (and through the 90s) and two of her famous influences were color coordination and hats. If you could match your hat with your 80s Chuck Taylors, you were hot stuff. Another popular trend in 80s clothing for women were (largely masculine) suits and shoulder pads, visually reinforcing the idea of strong women in the workplace. Everything reflected the conspicuous consumption of the time and puffy, flamboyant outfits were the norm. 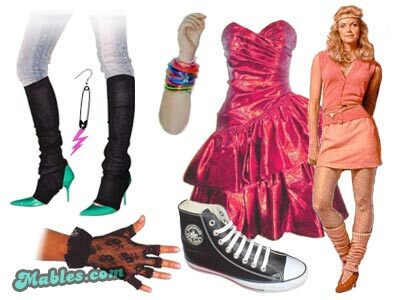 Whether you’re looking for an 80s costume to attend a themed 80s party, or just some 80s-inspired retro daily wear, you’ll find them in the same places. Depending on where you live, thrift stores are often the best place to score 80s style clothes, accessories and anything else from that time period. If your city doesn’t have a very good selection of resale shops or you don’t have the time to sift through the racks of clothing, eBay is your knight in shining armor. Many people make their living searching for rad 1980s clothes and selling them on eBay, so the selection is always really good and the prices are competitive.